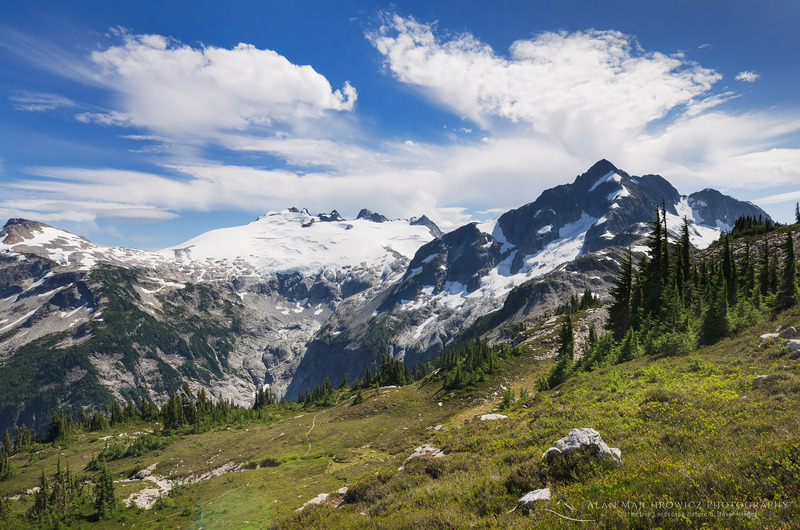 Here are a few more images from last year’s trip to Whatcom Pass in North Cascades National Park. After going through my files recently I noticed that these images were still in the “sketching” phase of processing. Sometimes looking back at images over time sheds new light on interpreting the feel of subject matters. 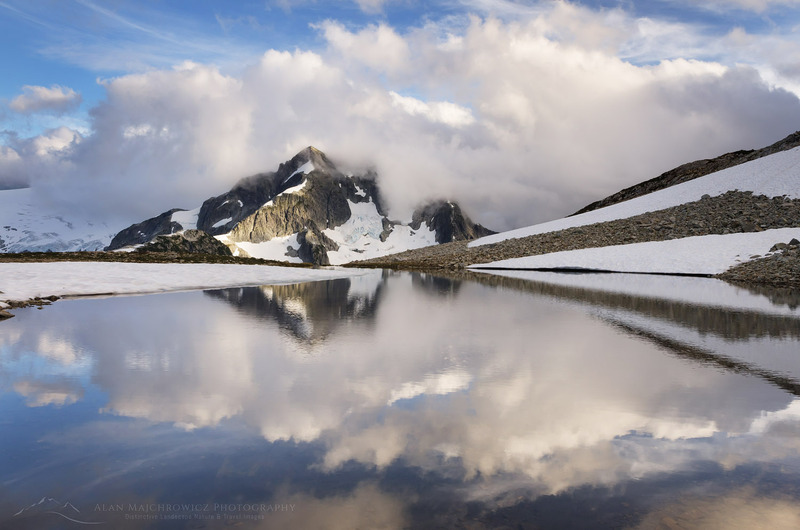 To read more about this special place read my earlier post on Whatcom Pass and Tapto Lakes. Now I’m off for several day photographing back at Washington Pass along North Cascades Highway. 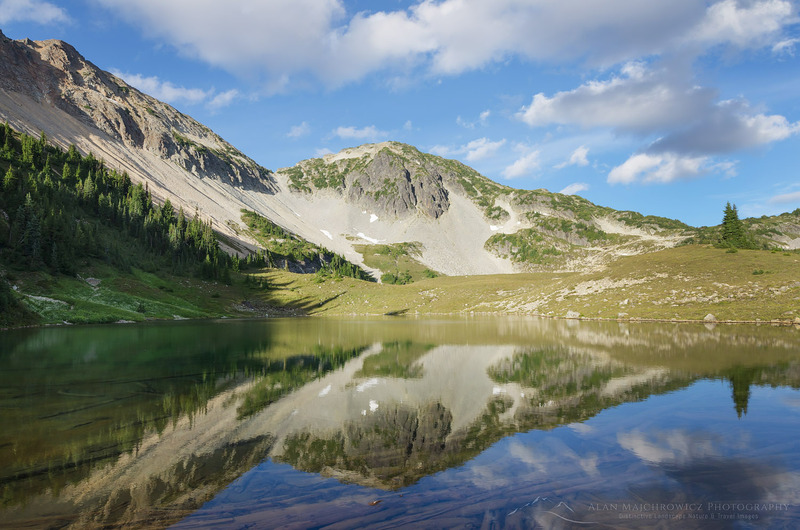 Tapto Lakes is one of those locations that many hikers dream about visiting. 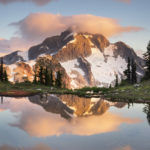 Remote, high in the subalpine, and surrounded by rugged snowcapped peaks, the lakes have all the features of a classic backpacking destination. 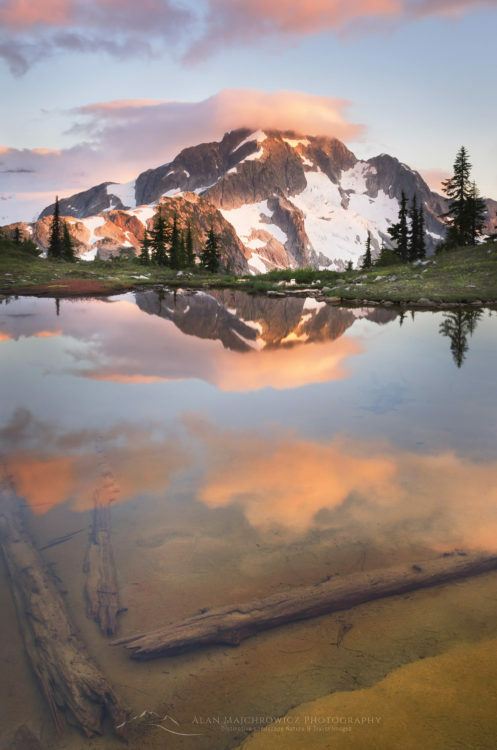 Tapto Lakes sit in a basin about 800′ above Whatcom Pass. The basin contains on large lake and several smaller lakes set in a heather filled subalpine meadow. 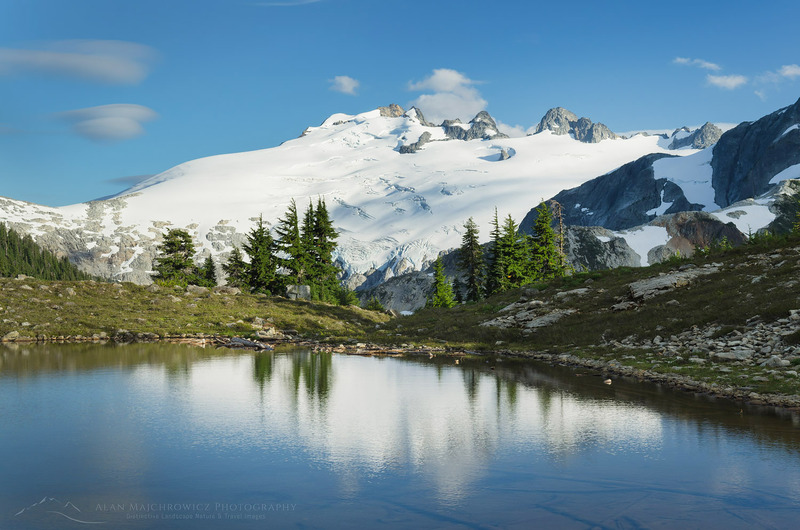 The basin is shaped somewhat like an amphitheater, with the main show being the stupendous views of Mount Challenger and Whatcom Peak. 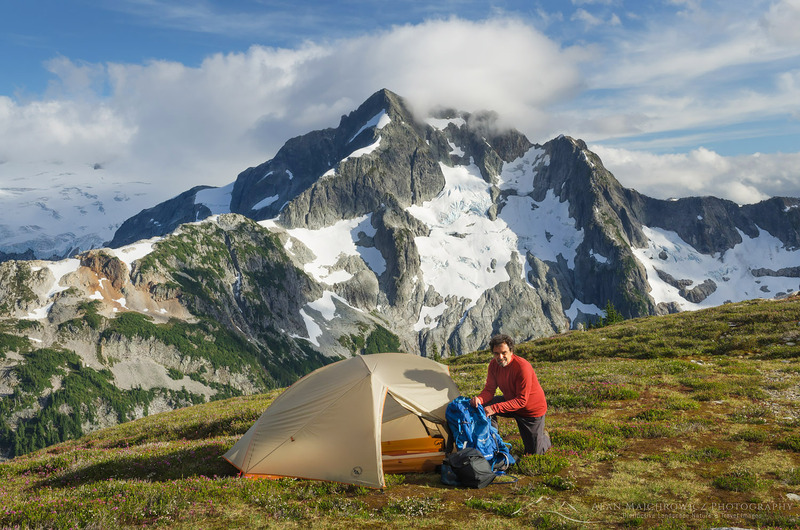 Situated in a designated cross-country zone by the park service, with a permit you are free to camp anywhere among the lakes, though with a few caveats. After investing two days of hard work reaching the lakes I woke up rested and refreshed. Content on not having to hike anywhere with a full pack I took in the view and planned my day. Of course since my main reason for being here was landscape photography I woke up early to survey the light. I had already identified several excellent spots to run to in the event of some great morning light. Unfortunately this wasn’t the case on my first morning, so I had lots of leisure time to explore all the lakes. My usual modus operandi is to spend most of the day scouting out and lining up possible compositions. I then try to assign a priority to them and work from top down when the lighting becomes appropriate. 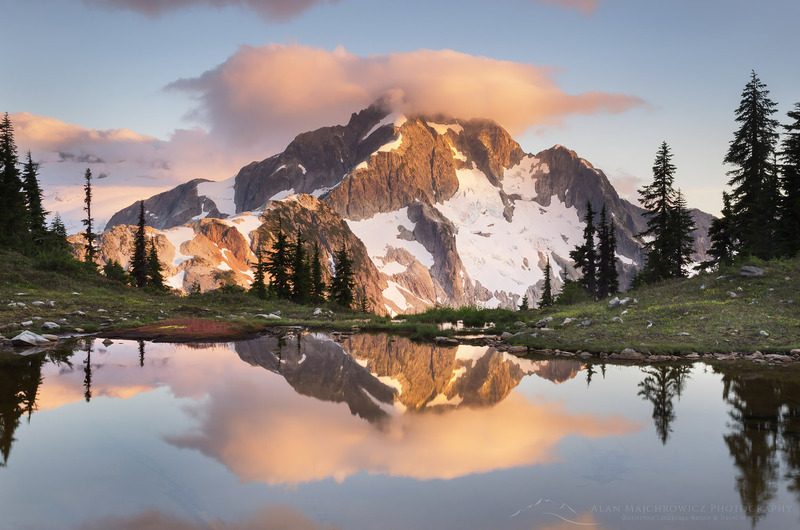 My first evening had some very nice light, enabling me to photograph some classic reflections of Whatcom Peak. On my second day I decided to move camp to a higher location. My map showed a very small lake not far away in its own small talus fringed basin on Red Face Mountain. It appeared to offer even more commanding views, along with quick access to a ridge on Red Face Mountain. The short hike up was definitely worth it. The lake still had some snow along one side and also had some good composition qualities. I quickly found an excellent spot to set up camp, after which I hiked up to the ridge. As I crested the ridge I was presented with incredible views of the wild peaks to the north. Dominating the view was Bear Mountain and the jagged needle-like spires of Mox Peaks and Silver Peaks. Far below the precipitous and crumbling ridge were the turquoise colored Reveille Lakes. All of this territory was completely devoid of trails, a true wilderness only accessible to the most determined mountaineers. I sat there for quite some time, contemplating how fortunate I was to be in such a special place. I got up after a while and headed back down the slope, wondering if I’ll ever return. Back down at the lake the day was wearing on and it was time to set up some compositions. 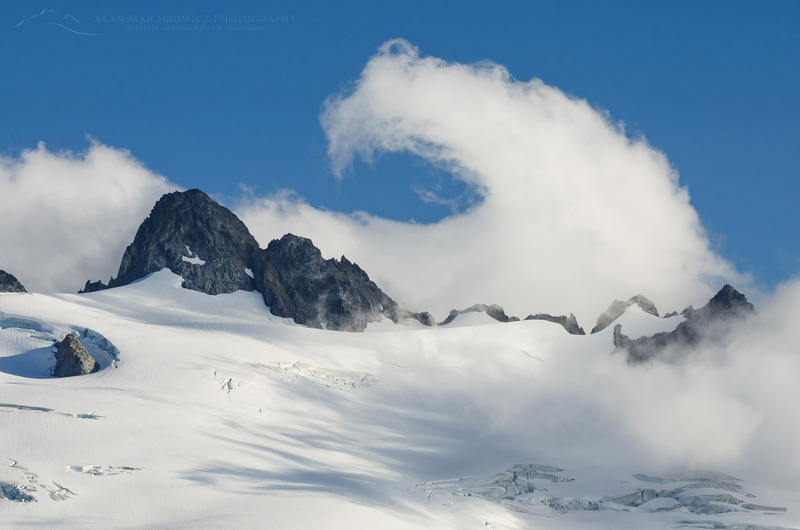 Some clouds had moved in and were swirling arounds the summits of nearby peaks. I was hopeful they wouldn’t completely sock in everything before sunset. 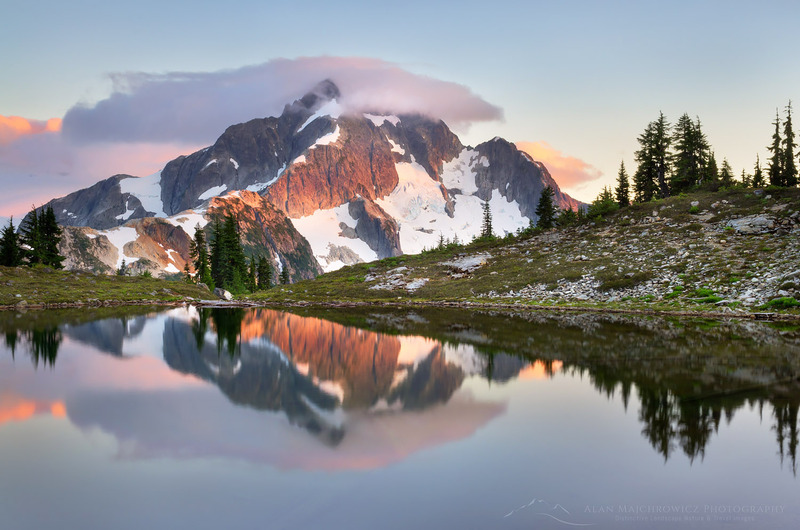 I moved to the back of the lake where Whatcom Peak cast a nice reflection in the still waters. Waiting to see what would happen I photographed a series of images in which the clouds and reflection created a sort of Rorshach effect. Although the light didn’t have a dramatic saturation of color, I did like some of the subtle pastel tones. All in all it was a very satisfying day. The next day feeling that I accomplish my goals and not wanting to overly duplicate images, I packed up and moved on. A bit east of Tapto Lakes are a few more small lakes, the most accessible being Middle Lakes. I decided to spend my last day here before heading back. Climbing back up to the ridge I turned and bid a somewhat sad goodbye to the lakes I had dreamed of revisiting all those years. Middle Lakes turned out to be an easy short mile or so further, there was only a steep rock slope to cross to add a bit of excitement. When I reached upper Middle Lake I found the setting to be somewhat desolate. Surrounded by steep slopes on three sides and a boulder filed at the outlet, there didn’t seem to be any good campsites. I moved on to check out the lower lake. The lower lake was more attractive, but it too afforded little flat ground for camping. However, when scouting for campsites I noticed an odd mound near the lake outlet with intense iron red soil. There appeared to be springs emanating from the mound. 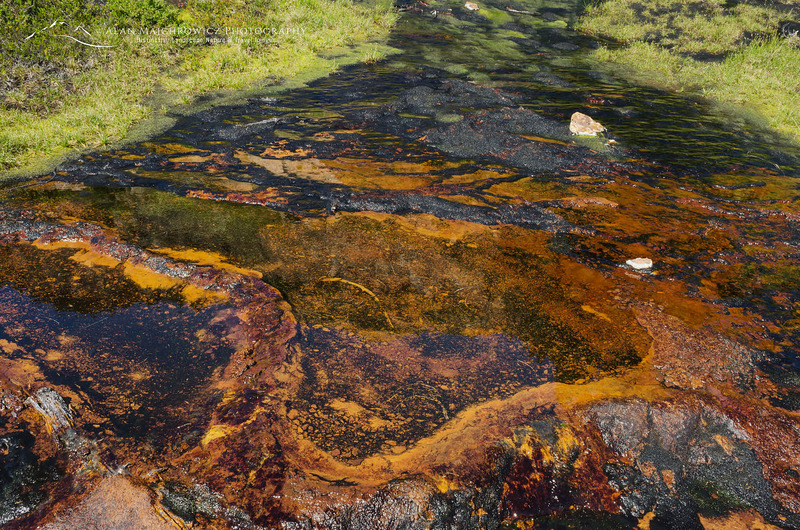 The main spring had formed small red mineral terraces similar to Mammoth Hot Springs in Yellowstone. I felt the water but it was cool to the touch. I ultimately found a nice spot for the night among boulders and heather meadows with a commanding view of Mount Challenger. For a mountain with such an imposing glacier it seemed that its elevation should be more than 8236′. 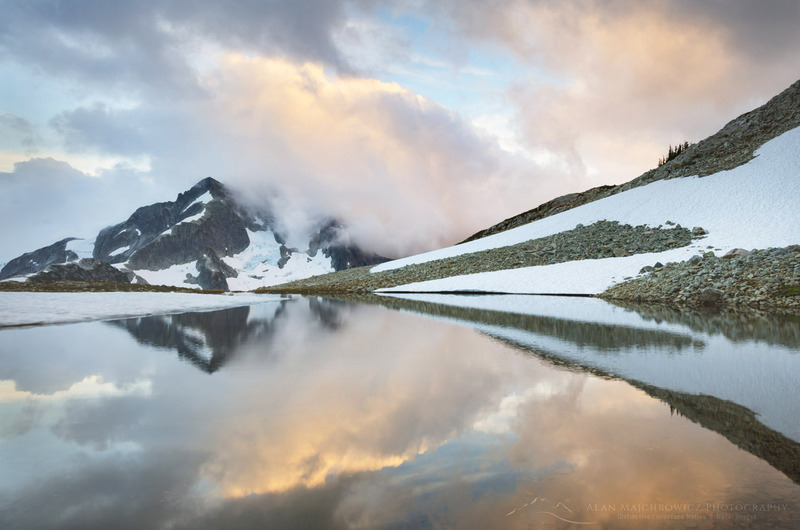 During my entire stay in the area I noticed a nearly constant flow of clouds near its summit. Apparently for such a modest height Mount Challenger tends to make its own weather, partly explaining the huge glacier. Most of that afternoon and evening I enjoyed and photographed a show of mists whimsically curling around the summit. To commemorate my trip to this special place I made several photos of my campsite, including a couple with the tent illuminated. The next day it was time to head out, retracing my steps down to Whatcom Pass and into the Chilliwack River Valley. Although I was filled with a deep sense of accomplishment and satisfaction, I was also sad to say goodbye. I faced a long day of hiking filled with retrospection on this and my first trip to Whatcom Pass many years back. Once again a highlight was riding the cable car across the river. After around ten miles I reached Copper Creek Camp, tired with plenty of hot spots on my heels and toes. The next day I faced the stiff climb back up to Hannegan Pass and then the final miles out to the trailhead where my truck waited. Nearing the pass I began to meet more hikers. Many of them were just beginning trips similar to mine. You could easily see the excitement in their faces, anticipating the wonders that were waiting for them. Of course I stopped to chat and helped stoke their excitement by passing on some of the highlights from my own trip. Then it was down the pass for the last five miles of the trip. Although I was out of North Cascades National Park and in the Mount Baker Wilderness, it was easy to sense civilization was close. I began to see more people on a wider well maintained trail. I got back to my truck in a few hours, in a parking lot that had dozens of cars in it. Tired but happy I began to drive home. 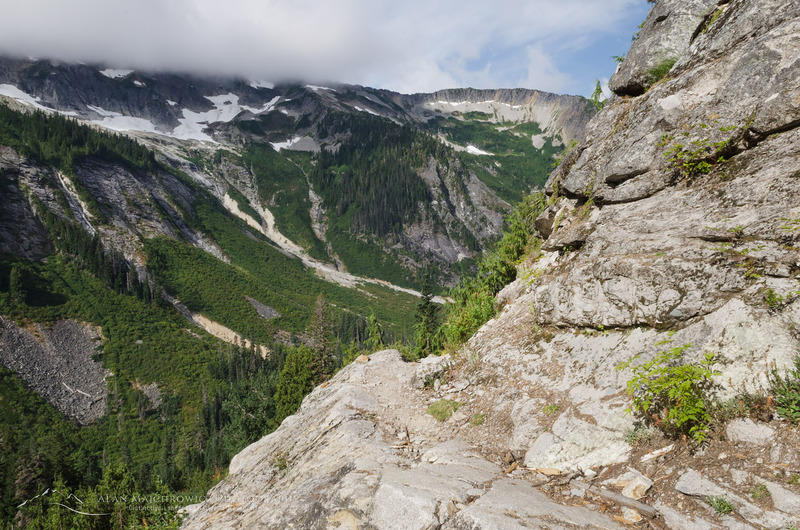 I began thinking how soon I might get a chance to go back to Whatcom Pass. Everyone has a place they dream of, somewhere that holds a special spot in their heart. At some point in their lives, usually at a young age, they see a picture or read a story about a place that for various reasons grabs their imagination. They carry it with them over the years and hope someday for the chance to visit it in person. For me it has always been mountain wilderness. And not just any run-of-the-mill mountain wilderness. It had to have a primordial feel. Dark mysterious forests, raging rivers, and rugged peaks with jagged rock summits jutting out from expansive glaciers. 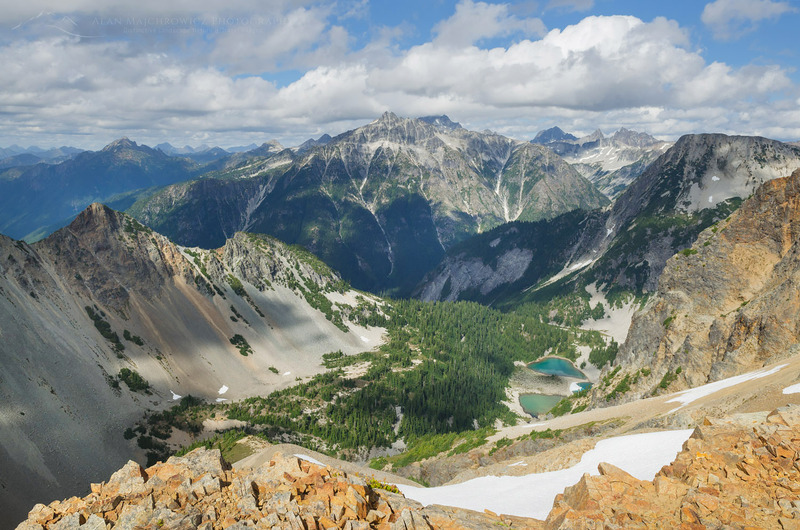 For me the North Cascades fit the bill perfectly. It was this vision that drew me to Whatcom Pass many years ago. Several weeks ago I was finally able to make a return visit to Whatcom Pass and Tapto Lakes, in North Cascades National Park. 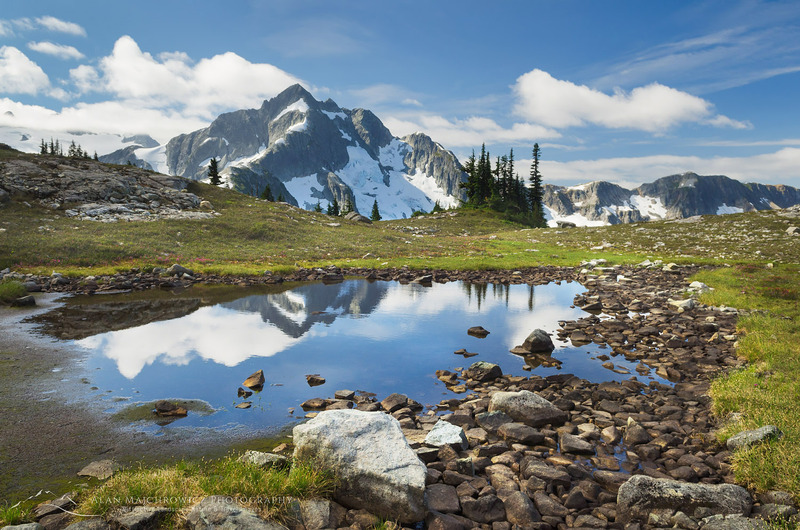 In the heart of the park, Whatcom Pass is quintessential North Cascades wilderness. It rises out of deep untouched forest valleys to jaw dropping views of rugged glacier clad peaks. Far away from any road town or cell signal. My first visit was way back in the late eighties and I’ve been wanting to go back ever since. There have been many reasons for my delayed return, not least of which is the long tiring hike accompanied by swarms of flying insects. Unlike most backpacking trips this one has a few major ups and downs in addition to covering lots of miles. The first day climbs a pass and then descends deep into another valley. The next day you must climb all the way up to another pass, then higher to the lakes basin. In all you’ll cover around 40+ miles and about 8500′ of elevation, including side trips, before returning to the trailhead. A very strong hiker could make it in two days, most people allow three to four days. My primary goal was for photography and relaxation so I gave six days to accomplish this trip. Aside from the photography thing I always feel that if you work so hard to get some place why hurry to leave? Take your time to relax and enjoy the surroundings! On the first day I made an early start, hoping to make it through the brushy Ruth Creek Valley before the black flies awoke. 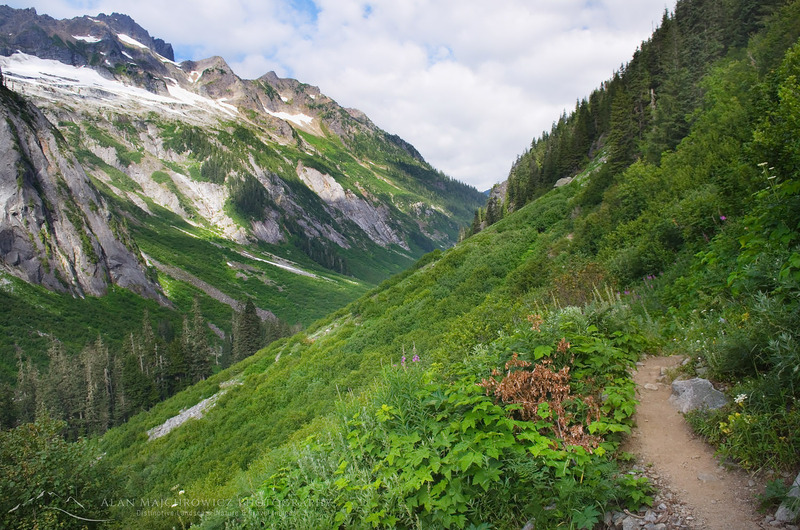 It’s about five miles and 2000′ up to Hannegan Pass, along a very scenic trail that sees very heavy foot traffic. I’ve been up this trail to the pass nearly a dozen times and never get tired of the open views of rugged Nooksack Ridge. About halfway up you begin to see snowcapped Ruth Mountain guarding the head of the valley. Ruth Mountain itself is a popular destination for hikers climbers, and skiers in early season. Although I’m not much of a mountaineer I managed to hike up the glacier to the summit several years back. 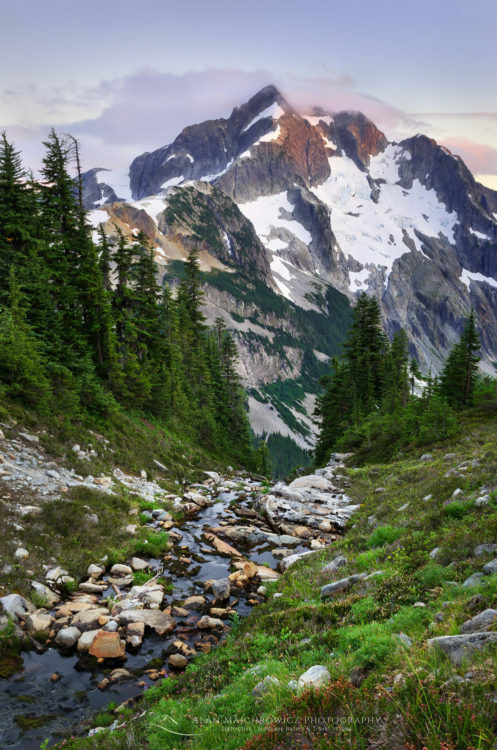 From the top you get an incredible view of Mount Shuksan and it’s glaciers spilling into Nooksack Cirque. Truly awe-inspiring! On reaching Hannegan Pass I took a rest to have a snack and dry off my sweat soaked shirt. I also chatted with a group of volunteers that were part of a trail maintenance crew. From here it’s all downhill into the wild Chilliwack River Valley, losing all that hard-won elevation. Shortly after leaving the pass I finally entered North Cascades National Park, indicated by a weather beaten-wooden sign. 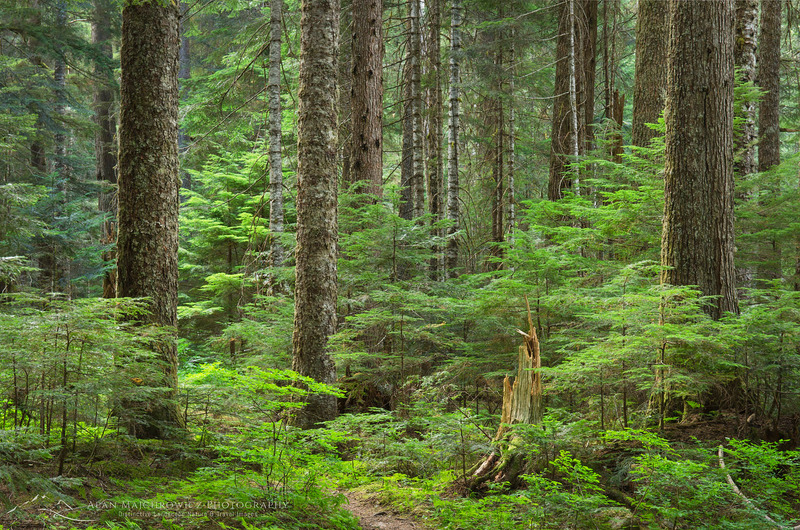 The hike down into the valley is through a beautiful untouched fragrant forest of silver fir, mountain hemlock and grand fir. 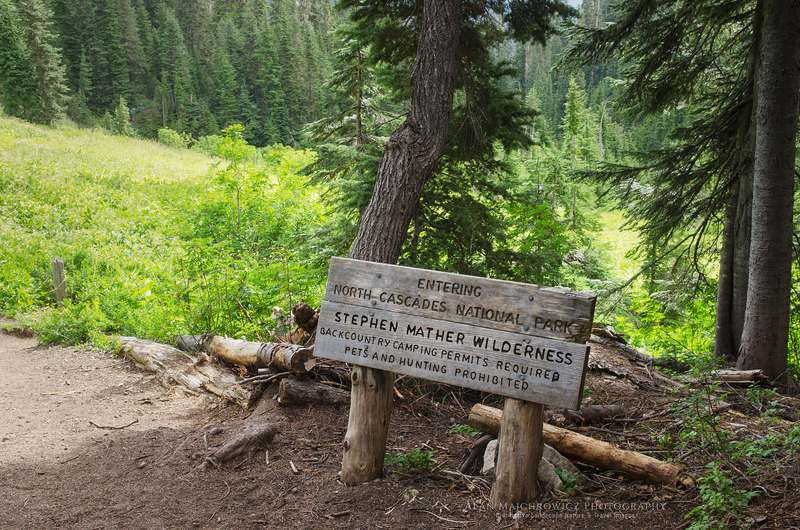 The feeling here of true wilderness is very tangible, even the trail seems wilder. From the pass I needed to travel another five miles to U.S. Cabin camp, my first night’s destination. Ten miles is about my limit for hiking with a full mutli-day pack, so I was glad to reach the camp and set up my tent. Amazingly there were very few bugs so far and I was able to relax and eat dinner along the river unmolested. I was even able to make a few photos of the impressive forest at this camp. That night I turned in early in anticipation of a grueling hike the next day. I had to hike another seven miles and over 3000′ up to my next and ultimate destination, Tapto Lakes above Whatcom Pass. The next morning I again got up early to hit the trail. 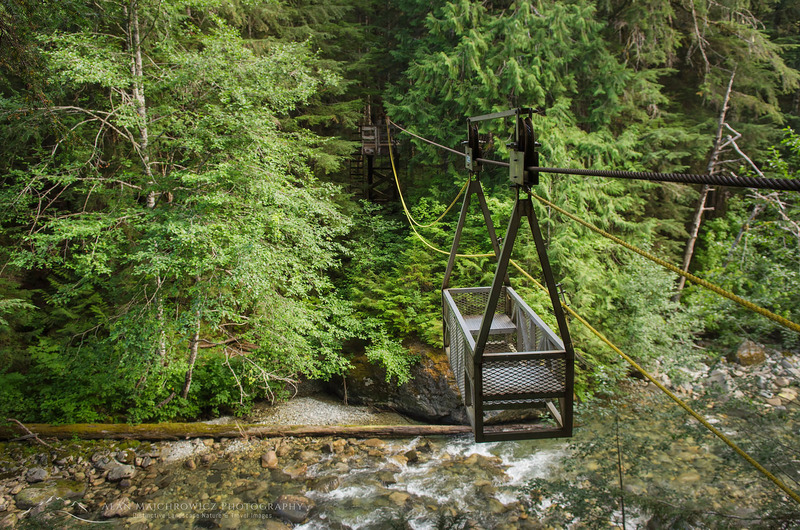 The first stop of the day was the unique crossing of the Chilliwack River via a hand operated cable car. I don’t know how common these contraptions are but for most hikers it’s a highlight of their trip. Later in the season crossing the river on foot wouldn’t be very hard, but why pass up such an interesting experience? Two hikers and their packs can fit in the car which is operated by pulling on a rope. It’s pretty easy getting across the first half since the cable sags down a bit. After that you begin to pull your weight up to the opposite side. By the time I got the car docked on the platform my arms were pretty tired from pulling. Of course I had to make sure I got a few photos before moving on. After the river crossing it’s back to work again on the trail, which now goes through a very brushy section. Years ago, on my first visit, the chest high brush was covered in morning dew. After a half an hour of hiking I was soaking from the waist down. A few miles later the climb to Whatcom Pass begins in earnest. The trail begins to rise from the valley bottom and gradually views open up to rugged Easy Ridge. After what seems like an eternity Whatcom Peak comes into view and the terrain begins to take on a subalpine look. I arrived at Whatcom Pass exhausted and again drenched in sweat from the climb. I still had another mile and 800′ feet of elevation to travel to my camp at Tapto Lakes. At this point I was wiped out and wasn’t sure if I could make it. The trail to the lakes is more like a climbers route, with sections so steep you need to pull yourself up by root and branches. While deciding if I had the energy I spoke with a few other backpackers doing the cross-park hike to Ross Lake. Like me they spent the whole morning climbing up to Whatcom Pass. However, they only paused briefly to take in the views before heading down again into the adjacent valley. Again I though to myself, what’s the point in all the work if you hurry past the best parts? The previous day I met a woman doing the Pacific Northwest Trail. This 1200 mile long trail starts at Glacier Park in Montana and ends at the Pacific Ocean. Like the Pacific Crest, Continental Divide, and Appalachian trails, you need to hike a set number of miles each day to complete it. During our brief conversation I couldn’t help admiring her determination and stamina. At the same time I also felt a bit sorry for her that she needed to hurry through such beauty to stay on schedule. By this time I felt physically and mentally rested enough slog up to reach my camp at Tapto Lakes. Taking it very slowly, the climb proved easier than I anticipated. Soon enough the views exploded to include Mount Challenger and the imposing rock buttresses of Whatcom Peak. A short 200′ descent into the basin brought me to beautiful Tapto Lakes. The day was still young so I took my time and leisurely explored the area to find the best campsite. The only other people there was a small group staying at the pass below. They had day hiked up to the lakes to take in the views and a quick dip in the frigid lake waters. When they left I had the entire place all to myself! Time to rest and take it all in, and do nothing but marvel at the rugged beauty that spread before my eyes. At last I returned to the place that held my imagination spellbound for nearly 28 years.